When I joined Imperative, they were going through an exploration / strategy phase in terms of identifying their product's purpose and value. Their current user base are professional who made a recent career change or attempting to make one. With that in mind, the team wanted to learn more about professional development and the use of mentors. 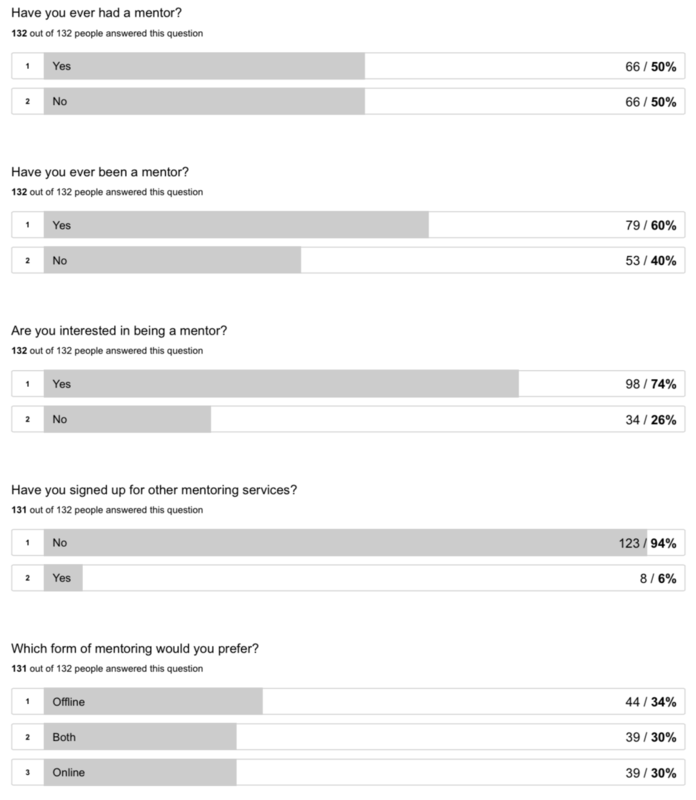 To understand more about the user's personal relationships and experience with mentorship, we created a survey to gain that insight. I plated a role and two parts, I helped design the UX in terms of where to place the survey on the current website as well as helping come up with the questions to ask the users. The response to our survey was a success. The turnout was very high with 132 responses. We leaned that professionals have had mentors in the past and were mentors themselves at one point. In addition, we noticed that users have not signed up for other mentoring services in their careers but they are interested in mentoring services. Also, the demographic incorporated professionals with + 10 years experience with 41% and 57% with -10 years experience. That shows us all professionals not matter of experience are interested in mentorship. The Imperative were also thinking about improving their existing 'Purpose Pattern' page shown on the left. Similar to the Myers-briggs test people take to identify their personalities. Users take the purpose pattern assessment to learn about their purpose pattern in their jobs. 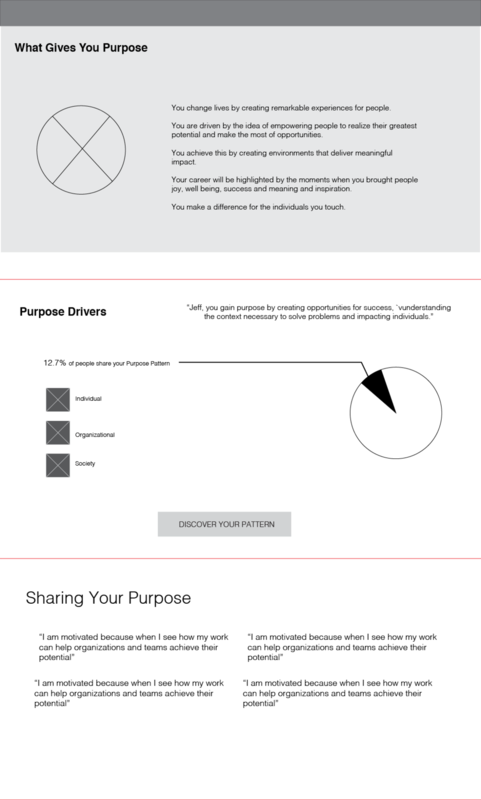 The 'Purpose Pattern' page displays and explains a users purpose pattern and shows their pattern in relationship with their other people in their community. The new 'Purpose Pattern' on the right was a new clutter free version. 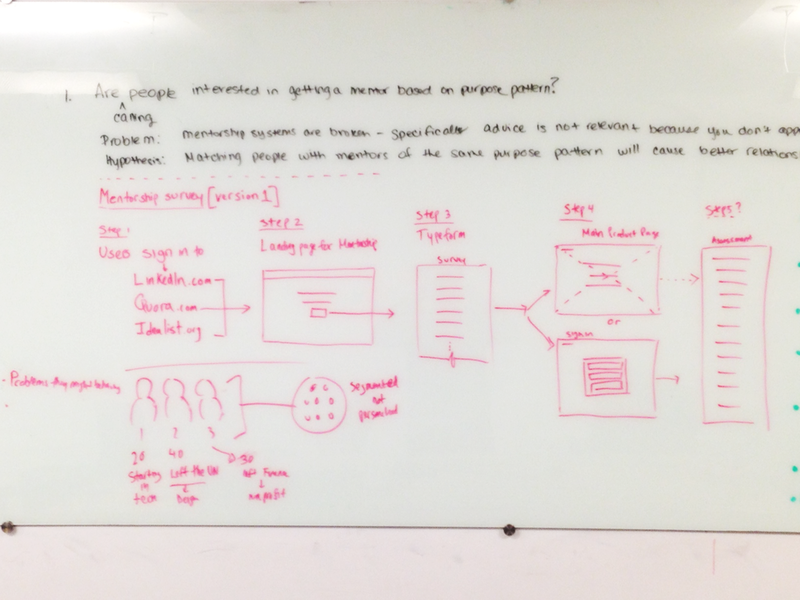 The copy and the layout ideas derived from an earlier meeting the founder had with the imperative team. These were some other design schematics. Like some projects go, this one ended after this point. If the project did end up going into fruition. I would continue conduction user testing and using their feedback to create high-fidelity mockups. There are also many details that would need to be addressed if mentorship was something the company would land on. For instance, I would research other competitors, learn about what make a successful mentorship experience and identify the pain-points associated with mentorship.